The world's Muslim population is expected to rise from 1.6 billion in 2010 to 2.2 billion by 2030, according to new population projections by the Pew Research Center. 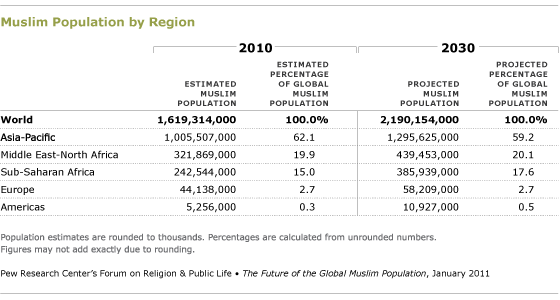 Globally, the Muslim population is forecast to grow at about twice the rate of the non-Muslim population over the next two decades. If current trends continue, Muslims will make up 26.4% of the world's total projected population of 8.3 billion in 2030, up from 23.4% of the estimated 2010 world population of 6.9 billion. The Muslim population is expected to grow at a slower pace in the next two decades than it did in the previous two decades. 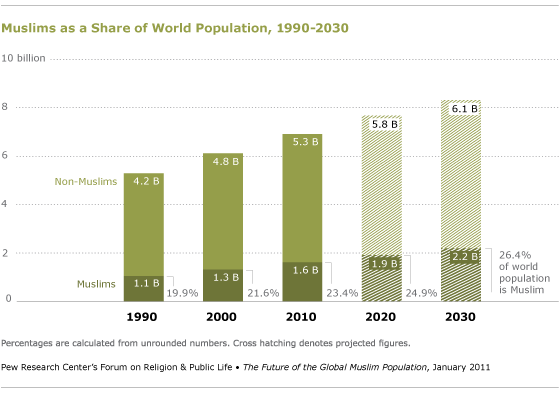 From 1990 to 2010, the global Muslim population increased at an average annual rate of 2.2%, compared with the projected rate of 1.5% for the period from 2010 to 2030. If current trends continue, 79 countries will have a million or more Muslim inhabitants in 2030, up from 72 countries today. About 60% of the world's Muslims will continue to live in the Asia-Pacific region and about 20% in the Middle East and North Africa. Pakistan is expected to surpass Indonesia as the country with the single largest Muslim population. In the United States, the population projections show the number of Muslims more than doubling over the next two decades, rising from 2.6 million in 2010 to 6.2 million in 2030. In Europe, the Muslim share of the population is expected to rise from 6% of the region's inhabitants in 2010 to 8% in 2030, rising from 44.1 million in 2010 to 58.2 million in 2030. The greatest increases are likely to occur in Western and Northern Europe. As of 2010, about three-quarters of the world's Muslims (74.1%) live in the 49 countries in which Muslims make up a majority of the population. More than a fifth of all Muslims (23.3%) live in non-Muslim-majority countries in the developing world. In the eight Muslim-majority countries where girls generally receive the fewest years of schooling, the average fertility rate (5.0 children per woman) is more than double the average rate (2.3 children per woman) in the nine Muslim-majority countries where girls generally receive the most years of schooling. Fewer than half (47.8%) of married women aged 15-49 in Muslim-majority countries use birth control. AR We shall need to educate a lot of women.